Centrally located, Thomas Dining Center features made-to-order Bonici Brother's pizza and pasta bowls. Thomas Dining also features a rotating menu with favorites such as Sombreros Grill, a great place to get custom made Mexican favorites. Wednesday and Saturday night is “Down Home Cooking” featuring pot roast, fried chicken, and other home style entrees. On the weekends, try our "Made to Order Skillets" with your choice of ingredients, such as onions, green peppers, mushrooms, ham, sausage, cheese, eggs and potatoes, grilled to perfection while you wait. Also, Thomas is the only Dining Center that offers late night service until 1:00am. Enjoy this option Sunday – Thursday and get some late night pizza with your friends! 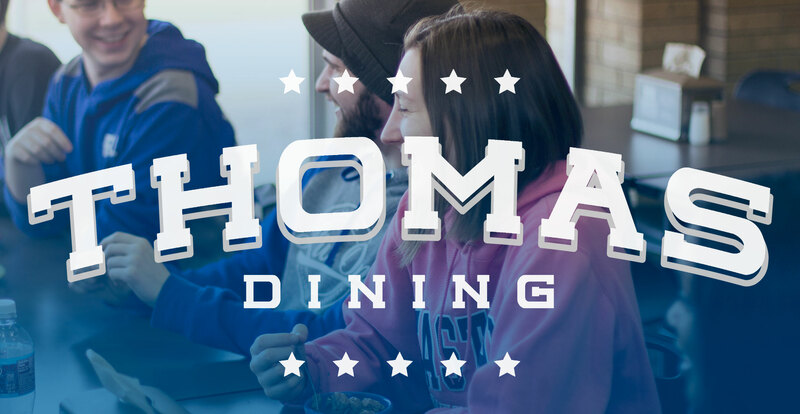 Thomas Dining Center will remain open for certain holidays and special weekends - watch for consolidation signs with special hours posted in the dining centers. To find out more about the Thomas Marketplace Convenience Store, click here.